My recent look at forgotten circuits in Europe rekindled my interest in the subject, and as I promised a trip across the Atlantic, it’s time to look back over the tracks that have been, and gone, in North America. With the new race at Austin, Texas, just a few weeks away now and the promise of a second US Grand Prix in New Jersey from next year it is time for F1 to do its very best to capture the hearts of the American public. For the likes of Mercedes-Benz, Ferrari and Renault/Infiniti – and any prospective motor manufacturers who may be eyeing an entry – the USA is an essential date on the calendar, but all attempts to ‘crack’ the country can safely be said to have not quite hit the mark. South America is a different matter: Brazil has always loved the sport, Argentina has a long history with F1, and Mexico also featured on the calendar with much success. To start with, let’s have a look at the possible reasons why F1 has never quite made the grade in the USA. The Yanks have their own culture of motor racing, and it’s fair to say it revolves – quite literally – around oval racing. 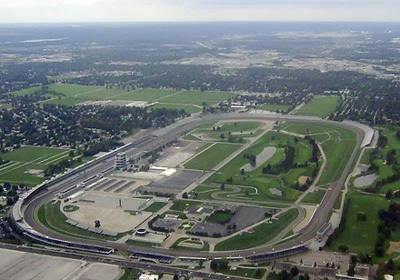 The Indianapolis 500 is rightly one of the most revered races in the world, but in fact the sport started before that circuit had even been built. Historians will tell you that The Milwaukee Mile is the oldest purpose built motor racing track anywhere in the world. It held its first motor race in 1903, and was originally built for horse racing. It exists today in a much-modified form – of course – but remains in the original location. The popularity of short oval racing led to a raft of new circuits across the USA, with wooden board ovals springing up in many towns. These led to concrete ovals, and many such remain today. However, this is not Grand Prix racing, hence these historic circuits are not on our agenda: instead, we must turn to the advent of the World Championship, in 1950, for the first clues as to why F1 was not going to be massive in the USA. In the first year of the World Championship the importance of the Indianapolis 500 in world motorsport terms was confirmed by its inclusion as the third round of the championship. None of the regular F1 entrants made an appearance. Guiseppe ‘Nino’ Farina, who would go on to take the title, had planned to run, but in the end did not turn up. 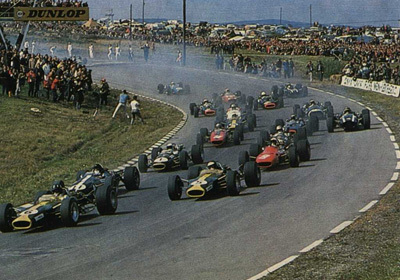 The 500 would remain part of the calendar until 1960, but with only sporadic entries by the F1 regulars. Why were the Grand Prix teams so reluctant to run in America? The fact remains that the Indy 500 is so far removed from a Grand Prix event that it was an anomaly on the calendar from day one. However, this did not stop the Grand Prix boys from looking at alternatives. The first US Grand Prix – as opposed to Indianapolis 500 – took place at the Sebring circuit, a long road course on an old airfield setting in Florida, in 1959, and was followed in 1960 by a one-off race at Riverside, in California. Indeed, California features heavily in the history of F1 in the USA, but from 1961 until 1980 there would be a US Grand Prix at Watkins Glen, an established circuit in New York. Legends abound about ‘The Glen’ and the races here were largely successfully; it is notable also that all of the circuits we have mentioned up to now are still in existence. So what about the ‘lost’ circuits in the USA? In 1976 F1 again featured two races in the USA, with the addition of a new venue, a street race at Long Beach, California. It is arguable that this was to be the most successful of all US Grands Prix venues, and the circus would visit until 1983. After that the circuit was used for Indy Car racing, and many fans lamented the loss of one of the truly great street circuits. The success of long beach had led F1 power-brokers to believe that street races in the States were the way forward; looking back now, it is comical in the extreme to see just how badly they got it wrong. After The Glen, traditionally the season closing event, was dropped in 1980 it was replaced by an ambitious yet curious race in Las Vegas. This took place in a temporary circuit, constructed in the car park of the famous Caesars Palace Hotel. It was, in just about every way, a disaster. The circuit was tight and slow, and far from challenging, and the crowds were practically non-existent. That it was repeated in 1982 is a thing of wonder. We should consign the Caesars Palace ‘experiment’ to history in the category of ‘best forgotten’, as it was a circuit that barely existed in the first instance. 1982 saw F1 getting rather too optimistic and introducing a third venue in the USA; this was Detroit – Motor City – and it ran as a back to back race with the (very successful) Canadian Grand Prix. 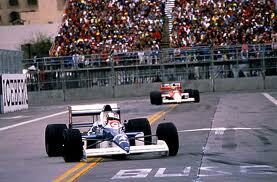 It is a credit to the organisers that the race ran until 1988, for again, crowd numbers were very low indeed. A one-off race in Dallas in 1984, in which the track melted in the extreme heat and the drivers found the circuit all but impossible to race on, proved a disaster, and from 1985 onwards the USA was down to just one Grand Prix a year. Perhaps the most interesting attempt at a US Grand Prix came with the venue that replaced Detroit; the Phoenix Grand Prix, in Arizona, would be held in 1989, 1990 and 1991 on yet another tight and twisty attempt to reproduce Monaco in the USA. What the track designers – in all attempts – failed to realise was that Monaco was special because, well, because it’s Monaco! Phoenix failed to draw crowds in any numbers that could be counted; in fact, legend has it that an ostrich race in the vicinity drew more spectators in 1991 than the Grand Prix. That was, then, the end for F1 in the USA until Indianapolis stepped in for the 2000 season, and even that venture failed to set the world alight. The Americans, it seems, are happy with ‘their type of racing’; NASCAR features action-packed close racing on super-fast ovals and attracts hundreds of thousands of spectators practically every weekend; the Indy Car series has its own loyal following, if not in the numbers seen at NASCAR races. It would seem that the great chasm that is the Atlantic Ocean has always been a barrier to the success of F1 in the USA. Perhaps, though, it is worth looking at things from a different angle: what if F1 had embraced road circuits rather than pushing forward up the blind alley that was races-in-cities? Watkins Glen was a success, after all, and the country is hardly bereft of road courses with character. In the wake of the demise of the Detroit race the authorities considered two options: Laguna Seca, a superb and challenging road course near Monterey in California, and Phoenix. The plumped for the latter on the grounds that Laguna Seca was too remote and would not attract the crowds. At lease, we can ponder now, there would have been no ostrich race to detract the attention. Road America, at Elkhart Lake in Wisconsin, is one of the most revered road courses in the USA, and has been hosting races since the 1950’s. A wonderfully attractive circuit of more than four miles, surely it would have been a better choice than Phoenix? Then there’s the aforementioned Sebring and Riverside, both viable options, and both capable of holding F1 in the era we are talking about. It seems that the desire to inject glamour and glitz into the races overtook the most attractive point: good racing. Hampered by the competition from well-established domestic series that still hold sway today, F1 simply failed to grasp the basics, and got it wrong on almost all accounts. That only Watkins Glen and Long Beach could be considered a success is a reminder that, while F1 needs the USA, the USA does not in any way need F1. So, what can we expect from Austin and New Jersey? The former is well on the way towards completion and appears to be supported by an infrastructure that is well thought out, but the latter has already raised negative comments from Bernie Ecclestone who, only recently, expressed the opinion it would not go ahead in 2013. Whatever the outcome, the problem remains the same: what can F1 give the US fans that they cannot get elsewhere, for less outlay, and with names they are familiar with? That remains to be seen, but for now, we can look at a separate parallel between the lost tracks of Europe, and those of the USA: the true fan mourns the loss of Rouen, of Rheims, of the Nurburgring; Las Vegas, Detroit, Dallas and Phoenix are not even footnotes in history.